Sitemap to all pages covering the state of Washington. Photographic contributions by Alex Nitzman, Andy Field, Chris Kalina and Matt Strieby. 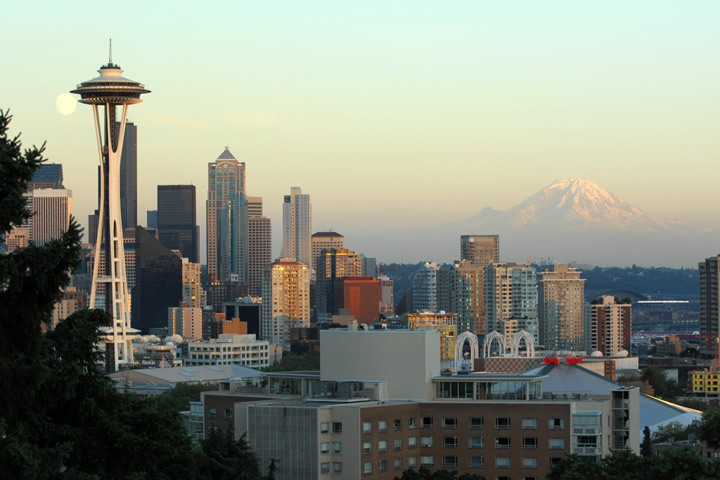 The Downtown Seattle Skyline, the Space Needle and Mount Rainier. Photo taken by Jeff Royston (07/28/07). Primary state routes are designated by single or double-digit numbers, with north-south routes being odd and east-west routes being even. For its secondary highways, Washington departs from more traditional numbering schemes. Numbering for these uses an associated primary highway number as a prefix followed by a one or two-digit suffix. 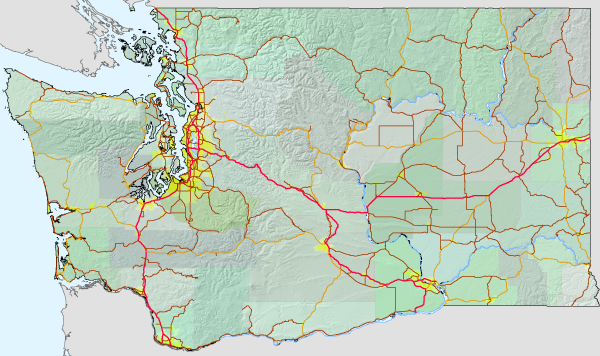 For example, State Route 500 originates at Interstate 5 (5 + 00). Heading north on I-5, the numbers increase, from SR 501 in Vancouver to SR 548 near Blaine. If the associated primary route is a two-digit number, the secondary suffix will have one digit, as in State Route 123 connecting U.S. 12 with Mt. Rainier National Park. Geography and climate: The climate of western Washington is heavily dominated by maritime air from the Pacific Ocean which brings abundant moisture in the winter and moderates temperatures during the summer. The Puget Sound acts as a conduit for this marine air, and consequently cities bordering or near the sound have a distinctly maritime feel. As in Oregon, the north-south running Cascade Range forms an east-west divide. East of the Cascades, rain-shadow effects contribute to a dry to very dry climate in the Columbia River Basin in the southeastern quadrant of the state. Cold winters and hot summers typify the region. Alternating mountainous zones and small valleys comprise much of the northern third of the state from Okanogan and Chelan counties eastward to the Idaho state line. In addition to the Cascade Range, the Olympic Mountains on the Olympic Peninsula create their own rain-shadow effects, although on a smaller geographical scale. Differences in rainfall amounts on the windward side and the leeward side of the range are extreme: over 200 inches may fall annually on the western slopes, watering the lush temperate “rain forests” that make the area famous. Locations immediately in the lee of the Olympics may receive fewer than 20 inches annually, or less than 10% of the wet side. Other interesting tidbits: The largest building in the world by volume, sprawling over 98 acres, is the Boeing assembly plant in Everett. Washington state is also home to the world’s richest man: Bill Gates. His company, Microsoft, which also happens to be the world’s largest software company, is headquartered in Redmond. Coffee giant Starbuck’s calls Seattle home, while Boeing maintains a manufacturing presence in the region despite moving company headquarters to Chicago in 2001. Kurt Cobain, whose band Nirvana turned the music industry on its head during the early 1990s, hailed from Aberdeen, a small coastal town at Gray’s Harbor.